Jonathan’s love of circus began in Mexico where he ran away with El Circo De Gran Choya, a traditional, family owned circus. After two years of traveling throughout Mexico he returned to begin studying aerial arts at Seattle’s own School of Acrobatics and New Circus Arts (SANCA). Jonathan’s unique combination of strength, grace, and dynamism garnered the attention of Komo News and The Seattle Times, where he was featured for his performance in the Seattle Boat Show and the tenth anniversary of the Moisture Festival. 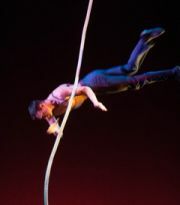 Three ensemble productions with The Acrobatic Conundrum, directed by Terry Crane, have shown Jonathan’s talent and range for theatrical work and interdisciplinary circus performance. Audiences have enjoyed his transformation from a humble, deeply endearing and somewhat inept clown to a powerful and technically impressive presence in the air. In January of 2014 Jonathan was honored to perform in the first annual Chicago Contemporary Circus Festival. Presently he is a member of the Impulse Circus Collective.